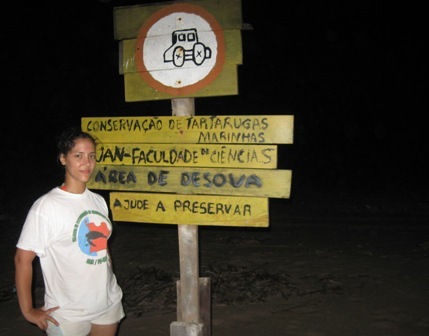 Standing in front of one of the signs she helped make and erect to keep vehicles from driving on the beach, university biology student Sofia has been part of the turtle conservation project for two years and gave a presentation to field trip participants on the weekend. Participants in the Angola Field Group’s overnight turtle trip on the weekend were not lucky enough to see any turtles come onshore to lay their eggs but we did raise US$500 for the Marine Conservation Turtle Research Project run by Dr. Michel Morais of the University of Agostinho Neto. Numbers of nesting turtles are down drastically this year probably due to the fact that fishermen’s nets run the length of the beach and are placed very close to shore. Check out: www.seaturtle.org/tracking for information on how you can adopt one of the Angolan turtles being tracked by the UAN Marine Turtle Conservation Project.